July 19, 2011 by Venky. The twilight of the dawn finally made an appearance bringing a silent delight. It felt almost as if it was a full moon night. The cool breeze was playing around with the gentle shower. The freshly washed greenery appeared to be nodding its head in approval. The only sound was the buzz of the tires against the wet road. It was almost a meditative experience. Another Sunday and another long ride on the cards. It was raining on Saturday night. But I was so confident that it will not continue till morning that I didn’t even look outside before I got ready. 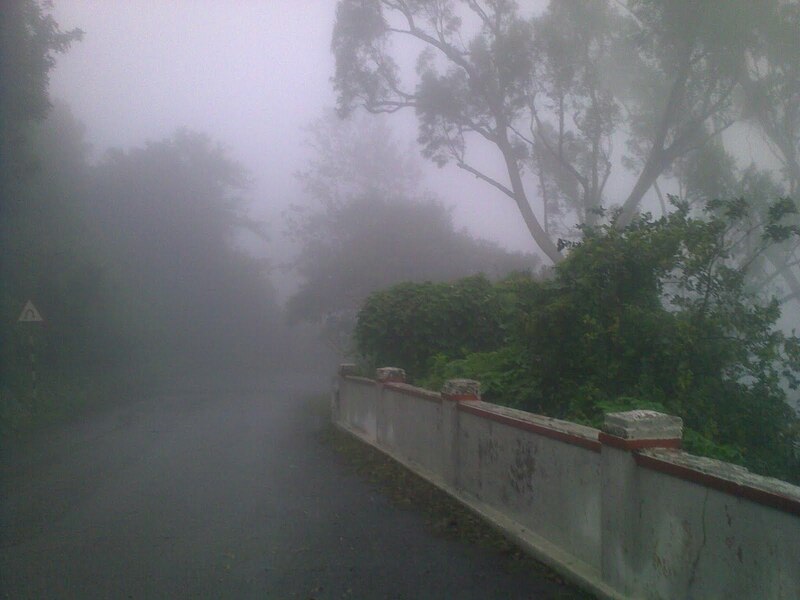 Came out of the house at 5am with the Bulldog and saw the drizzle. Since I got all decked up and ready, it didn’t take much time to decide to go ahead with the ride. As I started riding though, I realized that the bike head light was running out of battery and began to dim to a level that rendered it obsolete. I rode ahead counting on the morning light that usually makes an appearance at around 5:30am. But with the overcast skies that’s an obvious miscalculation and I ended up riding in dark for almost an hour. Then, the twilight of the dawn finally made an appearance bringing a silent delight. It felt almost as if it was a full moon night. The cool breeze was playing around with the gentle shower. The freshly washed greenery appeared to be nodding its head in approval. The only sound was the buzz of the tires against the wet road. It was almost a meditative experience. The plan was to do ride a minimum of 100km. So, I decided to head towards Nandi and decide on the climb after getting to the base. As I reached Nandi road, I heard someone calling me and stopped. It was Akash, a friend on dailymile. He was on his Hercules Cannon Barrel. A single speed MTB that was bought when he was just six. It was nice chatting up with the enthusiastic guy and riding with him till Nandi base. The drizzle got slightly heavier as I reached base. But, I decided to give it a try anyway since I got that far. As I began to climb, I focused on savoring the rain and tried to keep a decent cadence instead of pushing hard. I began to stand up at times to build some momentum before getting back to the saddle. On my previous rides, I strictly avoided getting out of saddle as that tended to increase my heart rate and also hindered the rhythm. This time I wanted to see if it helped to recruit different set of muscles by standing up for a few seconds in between. It seemed to have helped as I could complete the initial 5km of the climb nearly 6mins ahead of my previous time at the same point. When the steep section started I tried to apply the same principle of trying to gain momentum and trying to sustain it. But it was as tough as ever. To add to it, the visibility was close to zero with the fog. I was very watchful because with no lights, I might very well be completely invisible for the guys in the vehicles. Thankfully, most of the vehicles had their headlights on and that allowed me to sight them and stay far away from them. Somehow I could still manage to choose my line and could continue without stopping. Although I was eager to see the arch at the top, unlike the last time, I did not feel completely drained by the time I got there. I stopped at the arch and hit the lap button on my Garmin to see 37:49. More than five minutes shaved off from 43:03 of last time. When I started I didn’t have a target in mind. But I was hoping to bring it down to under 40 mins. So, in a way it was better than expected. The major difference I felt was the mental approach itself. I agree that I was in a slightly better shape with a slightly more regular riding, but, the main thing was that I was no longer riding in purely a ‘survival mode’. With the knowledge that I can complete the climb without stopping, a few mental roadblocks were cleared on my last attempt. That must have helped as I moved more positively on the climb. The respect for the climb and the slight nervousness is there but it is no longer a fear. The rain and the awesome weather helped as well. The Bulldog after the climb.. I was pretty vary of descending in those conditions. It was wet and completely foggy. So, I started descending very gingerly. I just followed an i10 which had its parking lights on as it descended. It became my shield. Before I could thank that guy for indirectly helping me, he picked up speed and disappeared after the steep part was done. By that time the fog also cleared and I was in a relatively safe zone. Without stopping any further, I hurried home via Siva’s road riding with a spring in the step(err.. cadence) after another satisfying Nandi climb. 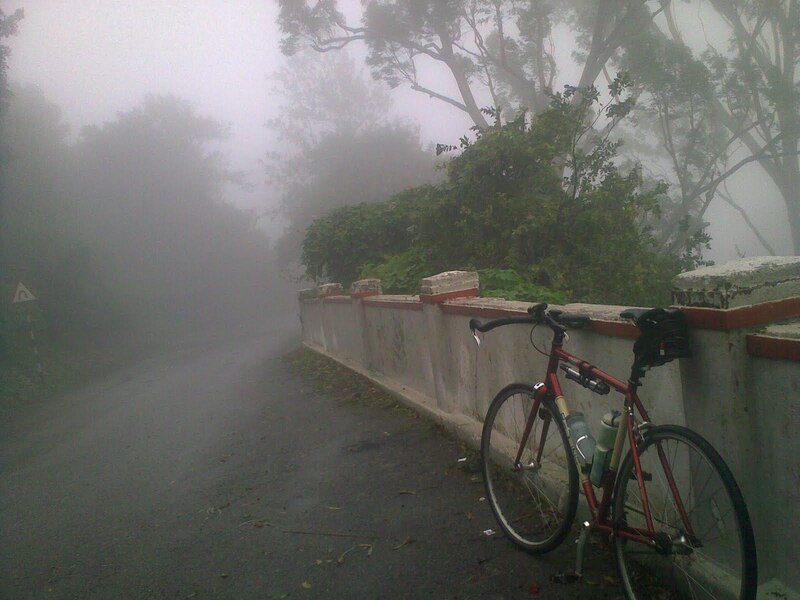 I never regretted riding in rain so far! It has always been great fun! Next A Fixed Gear Bike? No Coasting? Why??? Brilliant experience and write up Venky! From your description the poor visibility must have been a great challenge. All this on a fixie makes it even more special. Thanks Kishan! Visibility is definitely a challenge for everyone. I would say it is even more challenging for the guys going faster on motorbikes and cars. Some sort of visibility aids like front and rear blinkers will help a bit in making ourselves more visible to others and will increase the safety. Quite an adventurous ride it seems. Very beautifully written. I liked it. The image is so lovely. Thanks Harsha! It was indeed a beautiful day!